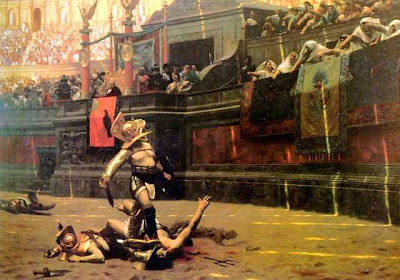 The Freedom Fighter's Journal: Ave imperator, morituri te salutant! Ave imperator, morituri te salutant! A person wouldn't know these are bad economic times by walking the The Strip in Las Vegas lined with one gambling palace after another. My favorite will always be "Caesar's Palace" with its Roman Empire theme and its statue of Julius Caesar with the right arm pointing at the main entrance. This is very good advice for those walking into arguably the most famous gambling palace in the world -- "Take a look pilgrim at this wealth on display and leave. This display came from the hard earned money from losers like you." Perhaps the owners of Caesar's should add a line by Dante to the pedestal of Caesar's statue, "Abandon all hope ye who enter here." I doubt such a warning would have any effect on business here at Caesar's or any other gambling joint on The Strip; the crowd almost pushes you inside as you approach the entrance. Don't these people understand the odds are so much against them? I think they know. I also think they don't care. I think at some level they see their trip to Las Vegas as a metaphor for life -- life is after all a gamble. If one successfully is born and escapes death by the high rate of abortion that in some areas of this country rivals the birth rate, then one has won big time at the lottery of life's first big wager. "Whether they win or lose, all these thousands of people you see today will be my clients. I daresay most won't be the 50 years of hard sales like you. I don't even have to say a word to them. I simply show my face and they follow me to the dark shore without resistance. I even sense happiness and bliss from the majority of my clients! I think they are pleased: They want to rest." I walk over to a bar in the middle of sea of gaming tables and slot machines. I set down and order a Coors, and Death sets down beside me and orders a Martini telling the very attractive and very blond young female bartender, "shaken not stirred like the ones James Bond orders." The bartender "Sally" by name tag takes our orders and you can almost hear her thinking, "A couple of born losers here -- an old man too cheap to buy mixed drinks and a creepy washed out salesman trying to be cool." I turn to Death and say, "I talked to the Secret Service (SS) this morning." "I know all about your conversation. I was there in the motel room when you called the agent in Orlando, Florida. I don't think it was a good idea. They like you not. This is especially true when you pop up out of nowhere. These guys are like the old Stasi in East Germany -- They come to see you at the worst possible moment, you don't surprise them. This is not how the secret police game is played and you ruined their sport for the day." Sally the bartender returns with our drinks and I ask, "I'm wondering if I could start a tab?" She smiles with visions of a good tip dancing in her pretty blue eyes, "No problem honey if you give me your credit card in advance and a minimum order of $20." I hand her my American Express card and she departs to open the tab. I take a sip of my Coors brewski and Death knocks back the entire Martini in one fell swoop. "It must be great to be Death and not have to worry about things like hangovers, liver cancer and heart attacks from excess drinking." Death smiles at me with pearl white teeth and states, "My job does have its upside. When I'm posing as a mortal I can actually taste the drink and feel the effect to some degree. I can't get drunk. Death must always be cool and rational." I change the subject, "But back to my conversation this morning with Agent Smith of the Orlando SS -- He seemed quite friendly and even said he knew me by reputation. I felt somehow flattered; I mean out many people can ring up the SS and be told they are known by the stranger answering the phone 3,000 miles away? I told him I'd heard they were asking everyone I knew in Melbourne, Florida where I'd got off to and these people were calling me on my cellphone asking me what the heck was happening, and since I didn't know the deal , I'd thought I'd go right to the source and ask the horse -- am I to be arrested? Agent Smith replied there were no warrants outstanding; they just wanted to talk to me to see how I was doing." "Agent Smith speaks from a script. He was the Duty Officer that day in Orlando. He has nothing against you personally but it's war and you are the enemy. I wouldn't believe anything he said. Did you know you're the only Class III type at liberty in the country? The others are all locked up or dead. At the higher levels of management it is personal as well as professional. If it were up to these SS officers, you'd be dead along time ago. They feel you're a threat to national security just by your continued existence. However, they are bound by federal law and dream of the day when they are the law. This day may be soon coming." "It'll cost you," he states. I motion Sally and point to Death's empty glass. She starts to mix another drink for him. Business is slow at the bar at 7 P.M. , the public is busy gaming and losing fortunes to Caesar. "What would you like to know?" asks Death with his white smile. I take a big sip of Coors and ask, "Will they ever stop dogging my heels?" "You know the answer: never as long as you live. You're too important; too many reports written about you; too many careers on the line. Also, for some important SS officers it has become personal -- You do recall Agent McKenna? He's a senior SS agents now. At one time he was case officer and you insulted him by saying he committed perjury when he gave testimony at your trial." Sally places the drink in front of Death and says, "Honey I don't what your problem is but you give me the creeps. I think you're had enough." "What do you mean?" she asks in a nervous voice. Death smiles at her, "You know exactly what I mean." "Don't let my friend bother you, Sally: It's just his way. He can tell jokes as good as Jerry Seinfeld when he's in a different mood. Sally calms down a bit and says, "You're okay, but your friend is weird. One more Coors for you and both of you cowboys are out of here. If you two try to stay I'll call security. Do I make myself clear? If not security will explain the situation. I can '68 anyone at anytime and you're out the door." "You have a very negative effect on people." Death kicks back the Martini in one gulp, "They can sense me. It's not a wonderful feeling, especially if you are young and healthy like our pretty young blond bartender. The gut feeling is to get me back to the shadows, or at least out of Caesar's -- I'm bad for business." "Agent McKenna did commit perjury!" Death smiles his pearl white smile, "Of course he did, but only under orders and for the greater good of the nation. He didn't expect to be called on it. So what else would like to know about the SS? They have you screwed, blued and tattooed, so you may as well give it up and take the sleeping pills. If you wash the pills down with Coors and put a plastic bag over your head you'll be at the dark shore in no time. Many of my clients do this in Vegas, especially after losing at the tables." Bartender Sally and Mr. Black the security guard approach our seats. Sally hands me back my credit card, "The drinks are on the house. I think you're good people, cowboy, but your creepy side kick reminds me of death warmed over. The deal is you can come back after you lose the grave digger and sober up, but El Creepo is banned from Caesar's property forever." Death smiles with white teeth flashing, "I don't think you can do that, but I'm on holiday so I'll leave with my good friend Ron." "Departing is such great sorry. But I'll be clean and sober tomorrow," I say. Sally laughs and feels her sunny self again, "A poet and you know it, Honey! As we say out West hasta la bye, bye!" "Hail Caesar! We Who Are About To Die Salute You!" I look back as we pass the doors -- for a moment the crowd has been frightened to the core of their beings and each of the hundreds of hearts at the gaming tables and slot machines have felt the icy grip of death for a moment-- but they soon recovery and continue their personal gladiator game with death at Caesar's Once And Forever Palace.